Our laboratory seeks to understand how neuron-glia communication facilitates the formation, elimination and plasticity of synapses—the points of communication between neurons—during both healthy development and disease. A major goal is to elucidate the cellular and molecular mechanisms underlying activity-dependent synapse elimination during health and disease, with emphasis on the role of microglia and immune molecules in this process. Using the visual system as our primary model system, we employ a combination of live imaging, molecular, biochemical and neuroanatomical approaches. Immune molecules in the healthy brain? Until recently the healthy brain was largely thought to be an immune privileged site. This view has shifted dramatically with the growing realization that the nervous and immune systems interact on many levels in health and disease . 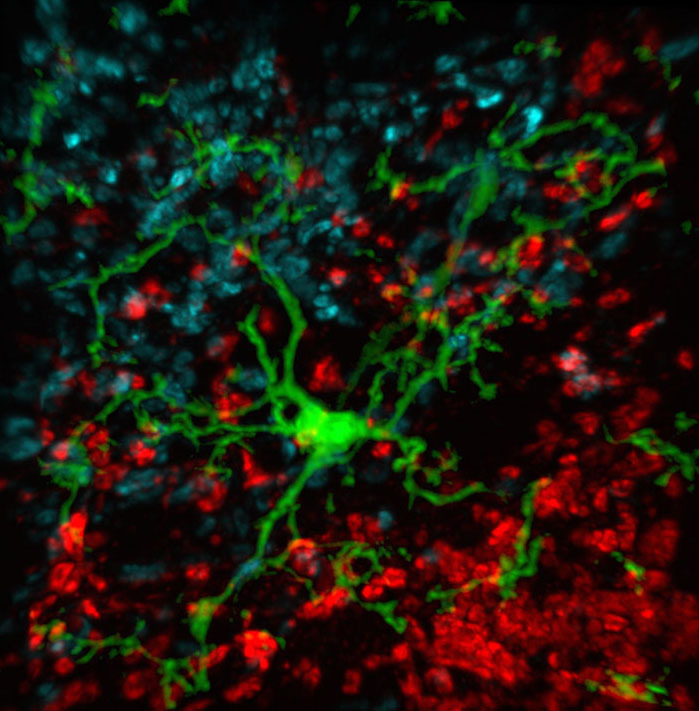 We and our collaborators have identified an unexpected role for glia and components of the classical complement cascade in developmental synaptic pruning. The primary role of the complement cascade in the immune system is to opsonize or tag unwanted cells or debris, which are then eliminated by phagocytic macrophages. We found that C1q and downstream complement protein, C3, target immature synapses and are required for synapse elimination in the developing visual system (Stevens et al., Cell 2007). One current goal is to understand how synapses in the CNS are selectively targeted for elimination by complement and other mechanisms. Why does one synapse get eliminated while a nearby synapse stays intact? Our recent findings suggest that microglia—the immune cells of the CNS—play an important role in the elimination process (Schafer et al., Neuron 2012). Recent work reveals that developing synapses are ‘eaten’—by microglia in the post-natal brain. Phagocytosis of synaptic terminals is dependent, in part, on CR3 as well as neuronal activity. Indeed, we found that microglia are required for pruning synapses (Schafer et al., Neuron 2012). Our work supports a model in which inappropriate synapses in the developing brain are ‘tagged’ by complement proteins (i.e. C3) and then eliminated by microglia. These findings are one of the first to implicate microglia in developmental CNS synapse elimination in the healthy brain, and suggest a novel mechanism by which synapses are eliminated in disease. Future goals are to understand other functions of microglia during development and to identify the mechanisms underlying microglia-synapse interactions. How are Synapses Eliminated in Disease? Another major goal is to understand the signals that regulate the complement expression and function. We found that an astrocyte-derived factor (Factor X) up regulates C1q in developing retinal neurons during synapse elimination. Moreover, a dramatic upregulation of complement occurs in glaucoma, Alzheimer’s, and other CNS diseases concurrently with the appearance of reactive astrocytes and microglia (Howell et al., JCI 2011)(Stephan et al., Annu. Rev. Neurosci. 2012). Although synapse elimination is largely considered a developmental process, early synapse loss and dysfunction are becoming increasingly recognized as a hallmark of many CNS neurodegenerative diseases; however the factors that trigger synapse loss in the aged and diseased brain remain elusive. In addition to our interest in CNS neurodegenerative diseases, we are probing the potential link between complement proteins and synapse loss in the pathogenesis of epilepsy and neurodevelopmental disorders.